The Labour Ministry will push for a plan to import 40,000 workers from neighbouring countries to solve a labour shortage in the commercial fishing sector. The government will open a “war room” tomorrow to keep track of water situation throughout the country around-the-clock in anticipation of another storm which was forecast to hit Thailand in the middle of this month with more rains, flash floods and landslides. Legal entities must be aware they are liable to penalties in cases of bribery, National Anti-Corruption Commission (NACC) chairman Watcharapol Prasarnrajkit said on Thursday. An association of trawl fishing operators in Nakhon Si Thammarat province has called on the government to allow illegal foreign workers to apply for permissions to work aboard fishing vessels for two years. Small and medium-sized enterprises (SMEs) are urged to register their businesses under the juristic person regime in order to obtain a variety of incentives meant to boost their competence. The Deputy Prime Minister, Gen. Chatchai Sarikulya, said the Labor Minister, Pol. Gen. Adul Sangsingkeo, has been in contact with a group of fishermen who protest against the planned ratification of the International Labour Organization’s (ILO) Convention 188, with an aim to find a solution for all sides. The Finance Ministry looks set to propose a draft bill on supervision of non-bank financial institutions to the cabinet, a measure meant to provide financial consumer protection, says a sourcefamiliar with the matter. BMW’s (BMWG.DE) said it is producing between 10,000 and 20,000 X5 sports utility vehicles in Thailand as a way to supply Chinese customers now that imported vehicles from the United States face a 40 percent tariff. Honda Automobile Thailand will soon begin local manufacturing of hybrid cars after the Japanese carmaker was granted Board of Investment (BoI) incentives last week. The Ministry of Social Development and Human Security has dispatched “One Home” team members to assist the people affected by flooding in many provinces across Thailand. The “One Home” teams. High water levels throughout the northeast have resulted in the road to Baan Pak Bang village in Na Kae district of Nakhon Phanom being severed. The Prime Minister’s itinerary yesterday saw him chair the launch of a Pracharat program for the development of grassroots economies, present an offering to the Supreme Patriarch on the occasion of Buddhist Lent and take part in the 72nd anniversary of the founding of the Bangkok Post, where he confirmed in a speech that general elections will take place next year if all goes according to the national road map. Deputy Commerce Minister Chutima Bunyapraphasara met her American counterpart this week, to discuss the possibility of maintaining Thailand’s eligibility for the Generalized System of Preferences (GSP) trade preference program. Construction of both a museum commemorating the rescue of the 12 Wild Boars and a statue of the ex-Navy Seal who lost his life during the mission has begun. More than 200 representatives of Phuket’s fishing industry gathered at Phuket Provincial Hall yesterday (Aug 1) to file a formal letter of protest against the ratification of International Labour Organization Convention No. 188 into Thai law. Saudi Arabia’s Ministry of Health has issued a license, allowing the Medical Office for the Hajj Affairs of Thailand to officially operate in Mecca. Thailand’s logistics performance has greatly improved this year, thanks to massive investment in transport infrastructure and relevant legal reforms. The New Nordic Group, one of the fastest growing construction, hotel and hospitality management company in South East Asia, stated today that they believe Asia’s emerging economies, particularly Thailand, are well positioned to prosper despite threats of tariffs and the U.S. Federal Reserve Bank’s policy of ratcheting up interest rates during the next 12-months. The Criminal Court for Corruption and Malfeasance Cases on Thursday rejected bail requested by five former senior officials of the National Office of Buddhism on the ground that their alleged offences were serious and that they might escape. An improving operating environment amid a continued economic recovery, along with robust capitalisation and loss buffers, support a stable outlook for Thailand’s banking system, says Moody’s Investors Services. 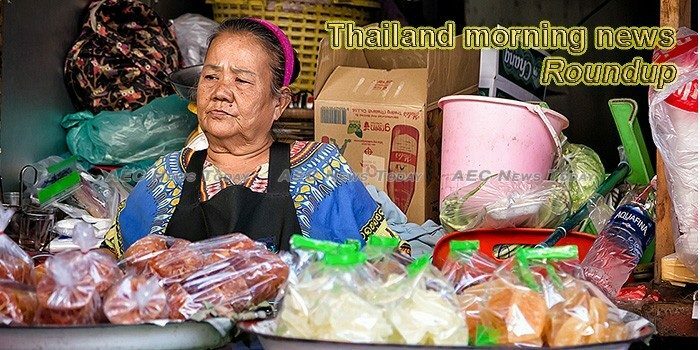 The Bank of Thailand (BOT) has reported continuous expansion of the Thai economy in June 2018 on the back of exports, tourism, investment and consumption. The Industry Ministry is developing new financial measures for small and medium-sized enterprises (SMEs), hoping to encourage them to seek out funding resources. Phayao Governor Narongsak Osotthanakorn today invited members of the government and private sectors for a meeting to discuss preparations for the opening of the checkpoint in line with a cabinet resolution adopted on July 31. On 20 July 2018, the Bangkok Military Court called for witness testimony of the Article 112 case, the royal defamation case, against “Waen” Nattatida Meewangpla, a crucial witness in the 6-dead massacre at Pathum temple in 2010. Thailand and India will launch a 14-day combined military exercise codenamed “Maitree 2018” next week to share techniques about fighting insurgencies and terrorism, a military official said Thursday. Kyaw Kyaw Naing wakes before the sun to start his first shift at 5am. At 11:30am, he gets a three-hour break before going back to work again until nearly midnight. The Department of Disaster Prevention and Mitigation (DDPM) has instructed local authorities in 41 provinces across Thailand to be ready to help people in cases of flooding and mudslides. The southern province of Satun has opened a Good Manufacturing Practice (GMP) certified compressed rubber processing plant aimed for international exports, helping local farmers to earn more income. Singaporean co-working space operator JustCo will open co-working spaces this year in hotels in the city-state, the company’s first in Southeast Asia, before expanding to Bangkok in 2019 at hotels owned by liquor tycoon Charoen Sirivadhanabhakdi. Rice is one of Thailand’s top agricultural exports in the international trade. But how does a business dealing with agricultural goods future-proof itself? Saksith Saiyasombut reports. Traditionally, tourists have trekked to the star of Thailand’s north in search of M.E.A.T. : markets, elephants, artisans and temples.